Everyone knew that when Jose Blanco joined the Joya de Nicaragua team that something interesting would happen. Mr. Blanco is well known to cigar fans and bloggers from his time at La Aurora, and his blending seminars have acquired a reputation approaching legendary. It didn’t take long before a blend with Blanco’s stamp was released from the company, with the assistance of Joya de Nicaragua President Dr. Alejandro Martinez Cuenca. 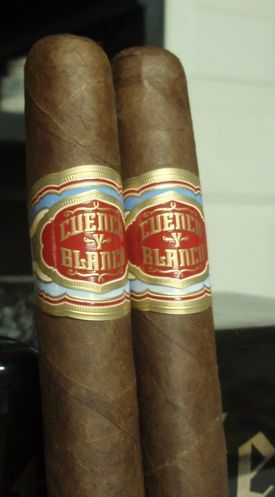 The name of the cigar was, naturally, Cuenca y Blanco. The name was shortly thereafter abbreviated to CyB in order to avoid confusion with other cigar brands (and to avoid potential legal hassles). The blend remains the same, even after the name change in October 2012: filler leaves from both Esteli, Nicaragua and Ometepe, Nicaragua, plus a little viso from Peru; a piloto cubano binder from Blanco’s own Dominican Republic; and an Ecuadorian habano wrapper. 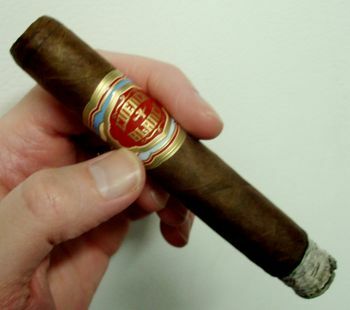 The CyB robusto is a solid stick with a dark, slightly dry wrapper. Peering down the business end of the cigar I can see there is one dark leaf swirled into the bunch. The head of the cigar is wrapped well and finished with a single cap. The cigar has a firm, even draw (maybe a little too firm) and burns evenly. The CyB is a medium-bodied cigar with great balance. The flavors on the palate are somewhat dry, with citric acidity and earthiness taking center stage. A mild saltiness is balanced by increasing spice as the smoke progresses to the end. The aromatic qualities of the robusto are excellent. I love the scent of wood smoke, and there’s plenty of that here. There is a muted sweetness as well, though I can’t really put my finger on what it smells like. Whatever it is, it blends nicely with the earth and acidity on the tongue. The reviews for the CyB lonsdale have been absolutely raving, so I was primed with expectation for an explosion of flavor from this cigar. But this may be a good example of how the size of a cigar can affect the blend and the overall flavor of a smoke. I would not call the robusto “explosive,” but rather a reserved, well-balanced and flavorful cigar. It is also a bit on the dry side. I especially enjoyed the nuances on the nose, despite my inability to articulate what those specific subtleties are. I’ll just have to keep working on it. The CyB Robusto retails in the $7-8 USD range. Try it if you dig earthy and citric flavors in a medium-bodied package. I’ve really enjoyed the Corona Reals I’ve had so far, and hear the Lonsdale may be even better. I’ll be trying the Torpedo soon, so it will be interesting to see how different they are. I’m finding that the Peruvian tobacco seems to add a kind of fruity brightness (if that makes any sense) to the cigars I’ve had with it as a component. It’s too bad that with all of their years in the industry, Srs. Blanco and Cuenca can’t put their own names on their product, but such is business.